A husband and wife team envisioned a retreat on their wooded lake property with a simple concept: provide a place that would strengthen sick children, their healthy siblings and parents. The retreat had to achieve this concept, while simultaneously meeting critical medical needs of children in an exciting, rustic setting. The retreat includes a town hall with classrooms, a meeting room, administration, food service and lodging for 24 families. The 7-acre wooded site slopes 50’ vertically to the water and is bifurcated by a large natural swale. 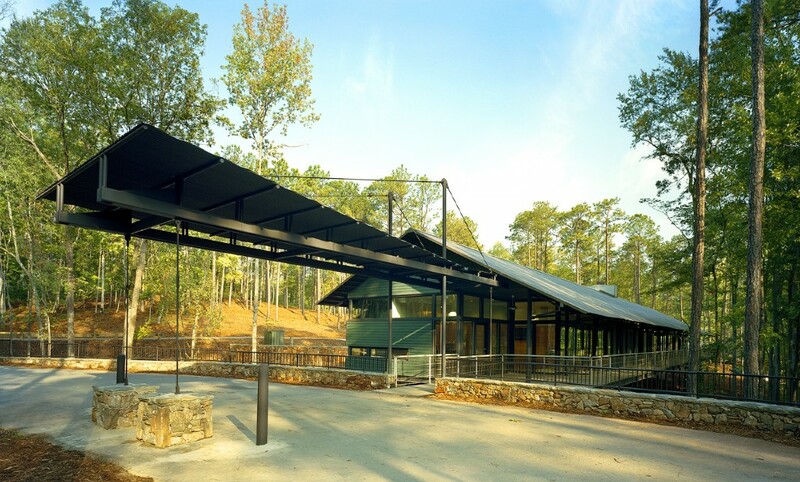 The project was designed and built with a reverence to nature, based on the planning principles of the area’s original settlers, the Creek Indians, who located their villages adjacent to water, developing a bilateral emphasis of communal space and private dwelling. Housing cabins are arranged on both sides of the swale in loose village-like clusters. The clusters maximize privacy and form common exterior spaces for recreation.